Leading law firm Seyfarth Shaw LLP has released information recording another historic year for federal wage and hour lawsuits filed under the Fair Labor Standards Act (FLSA) in 2015. In data obtained from the Federal Judicial Center, 8,781 FLSA cases were filed in 2015, up nearly 8 percent from 2014 which saw 8,160 cases filed. 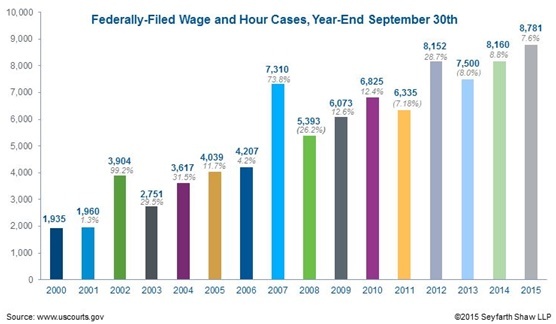 (See Seyfarth’s complete chart of federal FLSA claims filed between 2000 – 2015 below or here. The Department of Labor’s proposal last summer to revise the regulations on “white collar” exemptions has, as it did the last time the regulations were amended in 2004, caused employees and their lawyers to pay more attention to wage and hour policies and practices. Alfred expects the new regulations to be issued in 2016 and to dramatically increase the minimum salary level for exempt employees, index that salary level (and the minimum salary level for the highly paid employee exemption) to provide further annual increases, and, possibly, to change the way employers must determine whether an employee’s duties qualify for exempt status. 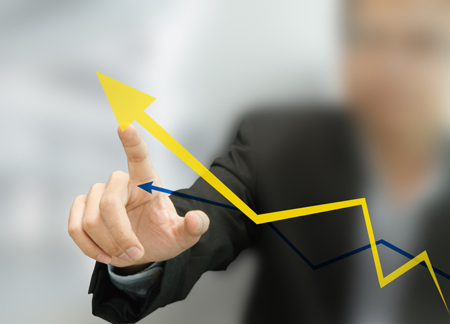 Increased attention on independent contractor classifications and joint employer status caused by (1) the Department of Labor’s July 2015 guidance that may make it harder for employers to use independent contractors, (2) the NLRB’s issuance of a major decision this year setting a new standard under labor law–and application of that standard to wage and hour laws–that increases the risk that businesses will be held liable as joint employers, and (3) a surge of highly publicized lawsuits against Uber and many other “on-demand” or “market” economy companies challenging their business models using independent contractors. An apparent easing by some judges of standards for class certification in wage and hour lawsuits which has resulted in one closely watched case against Tyson Foods at the United States Supreme Court. Talk of raising the minimum wage has increased focus on wage and hour laws and the availability of overtime pay.